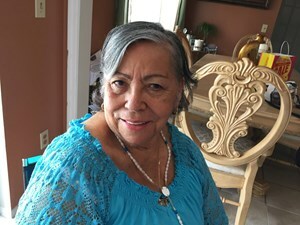 Carmen H Rivera Casals, Age 82, of Orlando, Florida passed away on Tuesday, October 30, 2018. She was born in Arroyo, Puerto Rico to her loving parents, Rosa Maria Casals and Juan Bautista Rivera. Carmen was the oldest of five children, Doris, Zaida, Lourdes, and Elba. Carmen is survived by her loving and faithful Daughters Sandra I. Davila, Wanda L. Davila and Carmen M. Davila and Son Jose M. Davila; Her Grandsons, Omar, Jose Raul, Jmar, Manny, Josean, Gabriel and Darren. Her only Granddaughter, Sara, Six Great-Grand Daughters and Grand Dog, Sparky. As well as many other relatives and friends, all who will miss her dearly. All are welcome to attend the Celebration of Carmen’s NEW Life at Newcomer Funeral Home - South Seminole, 335 East State Rd. 434, Longwood, FL, 32750; Friday, November 2, 2018 from 5:00 to 8:00 P.M. Father Augustine Clark will officiate the service at 5:00 P.M.
May God Bless Carmen and grant Her Eternal Peace. Love is patient, love is kind and is not jealous; love does not brag and is not arrogant, does not act unbecomingly; it does not seek its own, is not provoked, does not take into account a wrong suffered, does not rejoice in unrighteousness, but rejoices with the truth; bears all things, believes all things, hopes all things, endures all things. Love never fails; but if there are gifts of prophecy, they will be done away; if there are tongues, they will cease; if there is knowledge, it will be done away. For we know in part and we prophesy in part; when the perfect comes, the partial will be done away. When I was a child, I used to speak like a child, think like a child, reason like a child; when I became a man, I did away with childish things. For now we see but a poor reflection as in a mirror, ; then we shall see face to face; now I know in part, but then I will know fully just as I also have been fully known. But now faith, hope, love, abide these three; but the greatest of these is love. Add your memories to the guest book of Carmen Rivera-Casals. Loss my Rock, my inspiration, my protector, my warrior, she is with the Lord today watching over me and my sisters. I do not know how I'm going to make it without you. Mi Mamita querida que descanzes en Paz. Te Quiero, te adoro. Soy lo que soy solo por ti.